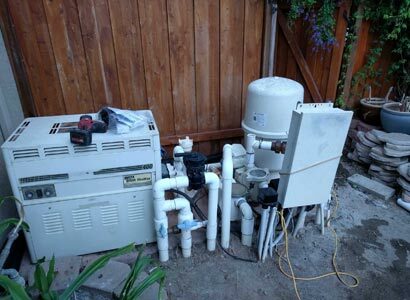 When outlooking at the necessary pool repairs/cracked valve, we noticed a very old pool filter. 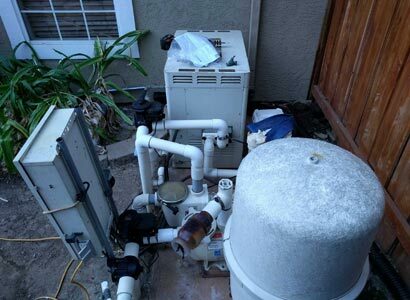 There was also a problem with their pool automation at this home in Rancho Penasquitos, CA. Their pool controller was falling over due to the mounting bracket was completey rusted. This was causing the controller to lay over pulling on the wiring. When discussing the pool repair needed, they decided it was time to get the other pool equipment repaired professionally. We sent them a written estimate for a new pool filter and moving their pool automation to the fence. Moving the pool controller to the fence will give them better access to the pool equipment. Then they wondered about installing a salt water chlorinator for the pool. We told them because of the large family and high usage of the pool that it would be a very good idea. 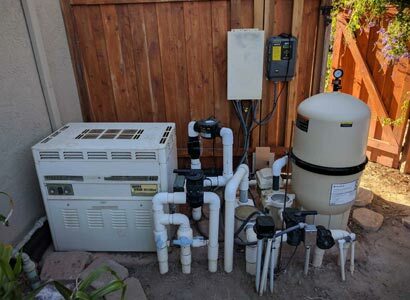 The saltwater system for this pool in Rancho Penasquitos will help them keep a steady level of chlorine in the water, keeping it safe for the family and friends. 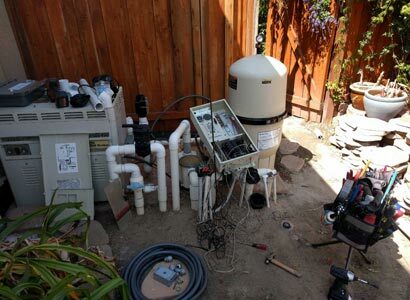 That is how this pool repair in Rancho Penasquitos turned into new pool equipment installation. We are also going to be replacing the old pool heater soon. Operating limits—Maximum continuous operating pressure of 50 psi. Pool/spa (bather) applications, maximum operating water temperature (internal filter) 104° F (40° C). Regardless if you need a pool repair in Penasquitos or are wanting new pool equipment, we can help. We provide complete pool repairs and new pool equipment installation for Rancho Penasquitos and the rest of San Diego County. Pool heaters, pool pumps, pool automation, filters, salt water pool systems, pool lights and much more. Please feel free to contact us with any questions or if you need to schedule your next pool repair or pool equipment installation, call now or fill out our contact form now!